It's a 25" handmade necklace and an eyeglass keeper. You've got your choice! 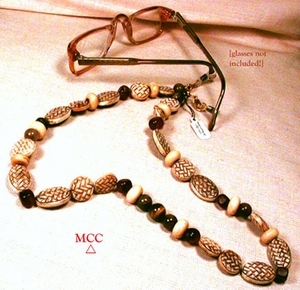 Hand carved bone basketweave beads with bone disks, horn cubes, round antique soochow jade and tiger's eye beads. We've added an extra clasp and loop so that you can de- or re-attach the eyeglass grips. Sleek! Would look great on your man, too!